On declaration of war with Germany the British Expeditionary Force (BEF) began to leave for France and Belgium. The BEF contained regulars, reservists and former soldiers from a number of different Irish battalions including 4th Royal Irish Dragoon Guards, 5th Royal Irish Lancers, North Irish Horse, Irish Guards, 2nd Connaught Rangers, 2nd Royal Irish Regiment, Royal Irish Fusiliers, 2nd Royal Irish Rifles and 2nd Royal Inniskilling Fusiliers. Additional forces were required for the front and Lord Kitchener, secretary of state for war, launched a recruitment campaign for volunteers. 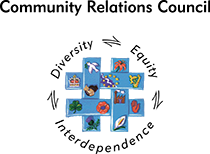 The Unionists offered the army 35,000 men from the Ulster Volunteer Force. These men went on to form their own division, the 36th (Ulster) division, whereas the National Volunteers joined the new 10th (Irish) and 16th (Irish) Divisions. The recruits to Kitchener's new divisions remained behind to train at Fermoy and Newcastle before travelling to Seaford and Aldershot to finish their training. 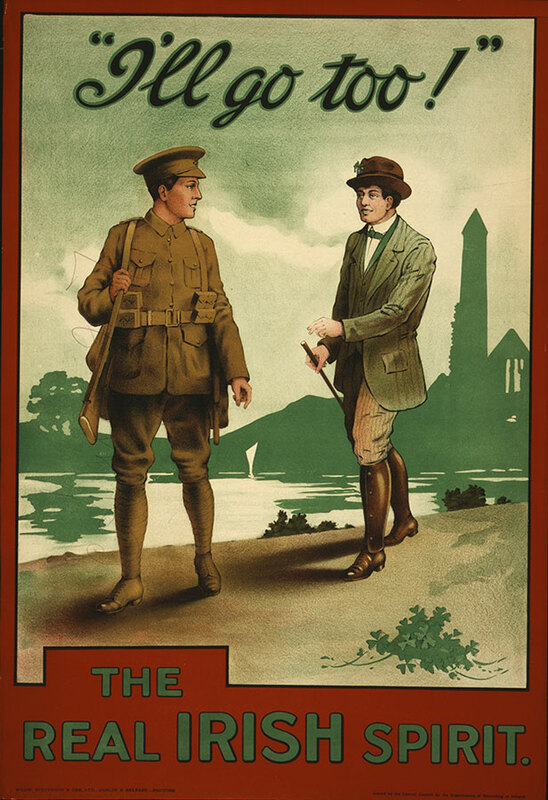 By April 1916, there were 150,000 Irishmen on active service in the war. 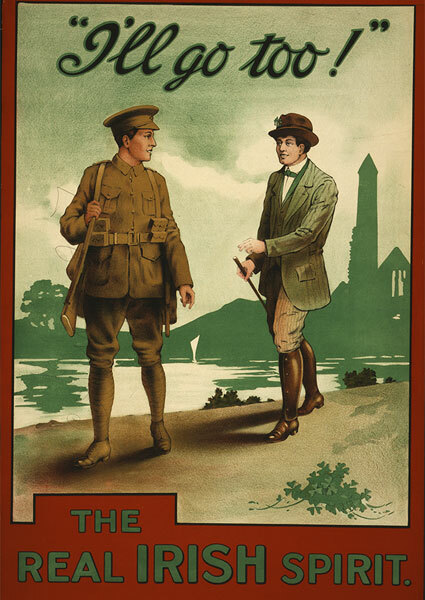 WWI recruitment poster showing a man dressed in green addressing a soldier.